I used the McGill Star Lily Punch and the Starburst to create the flowers and the leaves. I will likely do a tutorial on it soon. I had to improvise a little bit because I didn't have all the tools required to make it, but in the end I think it worked out. The font is one I found for free online. I can't recall the name of it, but I loved all the flourishes of it and think it turned out quite beautiful for the effect I was going for. The colors seem a little muted in the photo...I can't find my camera battery charger anywhere and so had to rely on my phone camera to take the picture. Fingers crossed I find that charger soon!! 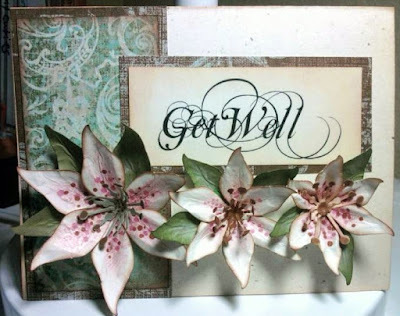 Very pretty card...love your flowers...Wow!